Recognizes Human, Rat, Mouse and Macaca ADPR2 Receptor. May cross react with ADPR1 Receptor. Synthetic peptide corresponding to Human Adiponectin Receptor 2/ADIPOR2 aa 362-380 (C terminal). Our Abpromise guarantee covers the use of ab77612 in the following tested applications. WB 1/1000. Predicted molecular weight: 44 kDa. Buffer used was: 10 mM KHPO4, 140 mM NaCl, pH 7.2. Highly expressed in skeletal muscle, liver and placenta. Weakly expressed in brain, heart, colon, spleen, kidney, thymus, small intestine, peripheral blood leukocytes and lung. Belongs to the ADIPOR family. The N-terminus is known to be cytoplasmic while the C-terminus is known to be extracellular. Membrane. Localized to the cell membrane and intracellular organelles. Paraffin section of human liver tissue stained with antibody to human ADPR2 receptor C-terminus ab77612 at 1/250 dilution. Paraffin section of human muscle tissue stained with antibody to human ADPR2 receptor C-terminus ab77612 at 1/250 dilution. 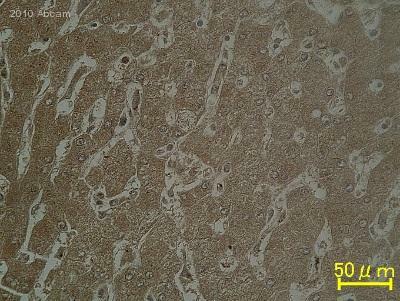 Ab77612 staining Adiponectin receptor 2/ADIPOR2 in Human liver tissue sections by Immunohistochemistry. Heat mediated antigen retrieval was performed using citric acid. Samples were fixed with paraformaldehyde and blocked with 10% normal goat serum for 15 minutes at 25°C. Samples were incubated with primary antibody for 12 hours at 4°C. A HRP conjugated goat anti-rabbit IgG was used as a secondary antibody at 10µg/ml. Publishing research using ab77612? Please let us know so that we can cite the reference in this datasheet. As you have seen on the datasheets for the anti-Adiponectin Receptor 2 antibody (ab77612) and anti-Adiponectin Receptor 1 antibody [EPR6626] (ab126611) have both been used in flow cytomertry. The data observed with the antibodies can also be found on the datasheet. I have summarised the protocols used and attached the images of the results for your consideration. Human mesothelioma cell line (ATCC: MSTO-211H), unfixed, were incubated with ab77612 in a dilution of 1/100 in 2% FCS/PBS for 2 hours. 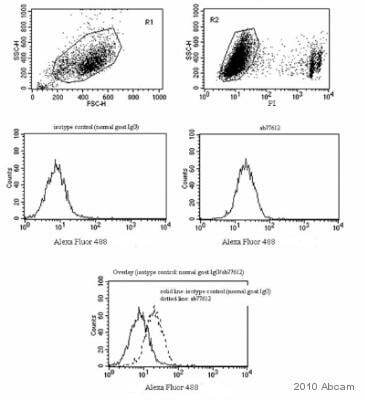 Detection was then performed using a donkey anti-goat IgG (H+L) Alexa Fluor® 488 antibody at a dilution of 1/200. The results obtained are attached to this email. HepG2 cells stained with ab126611 (red line in histogram attached to this email). The cells were fixed with 80% methanol (5 min) and then permeabilized with 0.1% PBS-Tween for 20 min. The cells were then incubated in 1x PBS / 10% normal goat serum / 0.3M glycine to block non-specific protein-protein interactions followed by the antibody (ab126611, 1/100 dilution) for 30 min at 22ºC. 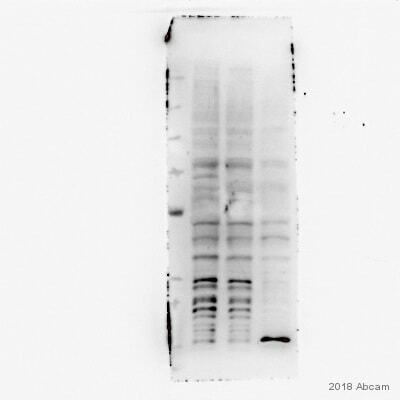 The secondary antibody used was DyLight® 488 goat anti-rabbit IgG (H+L) (https://www.abcam.com/ab96899.html) at 1/500 dilution for 30 min at 22ºC. Isotype control antibody (black line) was rabbit IgG (monoclonal) ( 1µg/1x106 cells) used under the same conditions. Acquisition of >5,000 events was performed. Both of these antibodies should work in the experiment you are hoping to perform and you would be covered by the Abpromise guarantee (for more information please follow link below). Should you encounter any problems please do let us know. The dilutions specified are only recommended starting points, for your particular experiment you are likely to need to optimise further in order to obtain the best results. I hope this information has been of help. If you have any further questions please do not hesitate to ask. 2 antibody (ab77612),because I can not see under the catalog number. In order to help you to choose the correct secondary antibody, could you please indicate which conjugate you would like to haveand which application you use the primary ab77612 in? I very much appreciate the quick response. I would like to replace ab77612 Adiponectin Receptor 2 with ab70362 Adiponectin Receptor 1 as this antibody is working wonderfully for me. I have noticed discoloration in your product and it have been in the -80 since my last communication. I really think your product is less than satisfactory. Thank you for your reply. I am sorry that this product is still not meeting your expectations. I would be happy to offer a replacement or credit. Please let me know which you would prefer. Can you please provide an order number or PO so that I may locate your previous order? I apologize for any inconvenience and look forward to your reply so that I may assist you further. Dear scientist: My customer used ab 77612 in WB assay, but they didn't get a satisfactory result. The details as below. The image of blot is included as an e-mail attachment. 1. Order details: l11x29@163.com · Batch No: can not find · Purchase No or order No: PO#xxxx3and order no: xxxxxx · Antibody storage conditions (temperature/reconstitution etc) Aliquoted and stored at -20℃ 2. Please describe the problem (high background, wrong band size, more bands, no band etc). no band 3. On what material are you testing the antibody in WB? · Species: 1:mouse liver 2: mouse muscle 3:HepG2 · Cell extract or Nuclear extract: cell extract · Purified protein or Recombinant protein: None 4. The lysate How much protein was loaded: Lane1 : 100ug lane2:100ug Lane3:80ug What lysis buffer was used: RIPA buffer What protease inhibitors were used: 10 μg/ml leupeptin, and 10 μg/ml aprotinin etc What loading buffer was used: 4×SDS loading buffer Did you heat the samples: temperature and time: yes,100℃ 5min 5. Electrophoresis/Gel conditions/ Transfer conditions Reducing or non reducing gel: non reducing gel Gel percentage : 10% Transfer conditions:.100v，70min 6. Blocking conditions Buffer: TBS Blocking agent: milk, BSA, serum, what percentage: 5% milk，0.1% Tween Incubation time: 1h Incubation temperature: room temperature 7. Primary Antibody · At what dilution(s) have you tested this antibody: 1：1000 · What dilution buffer was used:.5% nonfat milk · Incubation time: overnight · Incubation temperature: 4℃ · What washing steps were done: wash with wash buffer 10min with 3 times 8. 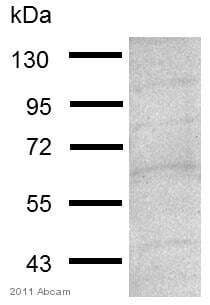 Secondary Antibody Specification (in which species was it raised against)?.Donkey polyclonal to Goat IgG At what dilution(s) have you tested this antibody: 1：5000 Incubation time: 1h Wash steps: wash with wash buffer 10min with 3 times Do you know whether the problems you are experiencing come from the secondary? No 9. Detection method ECl, ECl+, other detection method: ECl 10. Background bands · Have you eliminated the possibility that any background bands could be due to the secondary antibody? (Run a “No primary” control): Yes · Is the blocking step sufficient? Yes Are your washing steps sufficiently stringent? (Multiple short washes are more effective than fewer longer wash steps) yes · Please provide an image of your blot (as an e-mail attachment, a faxed image is not sufficient) 11. Did you apply positive and negative controls along with the samples? Please specify. We applied positive control of HepG2 which was recommended in structions. 12. Optimization attempts · How many times have you tried the Western? Twice · Do you obtain the same results every time e.g. are background bands always in the same place? No · What steps have you altered?We altered Primary Antibody concentration from 1:1000 to 1:500, and Secondary Antibody concentration from 1:5000 to 1:3000,and ECL exposure time was adjusted to 1h Instruction shows 10ug HepG2 protein can be easily detected adipoR2 ,however, we found even 80ug HepG2 protein cannot be detected adipoR2 as normal primary and 2nd antibody concentrations. So we expect a reasonable explanation. Thank you for taking time to complete our questionnaire. I am sorry to hear that this antibody is not providing satisfactory results. The details provided will enable us to investigate this case and will provide us with vital information for monitoring product quality. Having reviewed this case, I would like to clarify a few things. Has the protein been sucessfully transfered to the membrane (can be checked by Poncau staining). Also, is there any reason why non-reducing conditions are being used? We would typically recommend using 10 mM fresh DTT or 5% 2-mecaptoethanol in the loading buffer to ensure the disulphide bonds in the protein are fully reduced. Additionally I would offer some suggestions to help optimise the results from ab77612. As you have noticed, the Western blot presented on the datasheet was performed using 10 µg of HepG2 whole cell lysate and your experiment should therefore show the band expected. Indeed there appears to be a faint band at the expected size (44kDa). Adiponectin receptor 2 has seven transmembrane hydrophobic domains, expressed at very low levels in most tissues. In order to perform a successful western with such a protein we recommend making cell membrane preparation (as you have been doing) and a then loading 100ug of solubilised membrane protein per lane. It may be worth adding 4M urea to the loading buffer to improve the denaturation and running of the protein in the SDS-gel. I would also recommend to separate proteins on SDS-PAGE gels at 15-20mA constant current when 100-150ug of protein is loaded in each lane to ensure clear separation. SDG-PAGE can be run overnight at 5-7mA constant current and next day in the morning the current should be increased to 20mA until the dye front reaches the bottom of the gel. This will tighten the bands in the gel. Additonally, when transferring hydrophobic integral cell membrane proteins Tris-Glycine buffer containing 0.1% SDS and 10-20% methanol should be used to facilitate transfer of proteins that have 7 hydrophobic domains. I would also try using a different blocking agent such as 3% BSA, with 0.1% Tween for 1 hour at room temperature. It would also be worth removing the blocking reagent from the primary and secondary antibody diluents and trying incubation at both at 4°C overnight as you have been doing and for 2 hours at room temetrature with aggitation. Hopefully these suggestions will improve the results. However, if you continue to have problems, please do let me know. In the event that a product is not functioning in the species and applications cited on the product datasheet (and the problem has been reported within 6 months of purchase), we would be pleased to provide a free of charge replacement, credit note, or refund. I hope this information is helpful, and I thank you for your cooperation.